Motorized standing desks sound great in theory, but what happens if you have a desktop tower PC with multiple monitors, speakers, and peripherals attached? One snagged wire could bring a bunch of things crashing down. Lian-Li, a designer of some pretty crazy PC cases, may have solved the problem by letting users build a computer into the desk itself. The final DK-04 build is a refined version of the prototype revealed at CES 2016 (shown in the video above), with a removable motherboard tray with support for ATX or mATX boards. It can also hold extra-long graphics cards (up to 320 mm), and allows up to 10 hard drives—two on the motherboard tray, and eight across a set of four detachable hard drive racks. On the front panel, the DK-04 has four USB 3.0 ports, HD audio input, an optical disc drive bay, and a dimmer/controller slot for an optional lighting kit. The desk aims to support high-end gaming as well, with four 120 mm intake fans and four exhaust fans on the back, all of which can be swapped for water cooling radiators. Lian Li's DK-04 motorized standing desk-PC case hybrid. The desk itself is built from aluminum, with iron legs that support up to 220 pounds, and a tempered glass top measuring 47.2 inches wide by 29.5 inches deep. 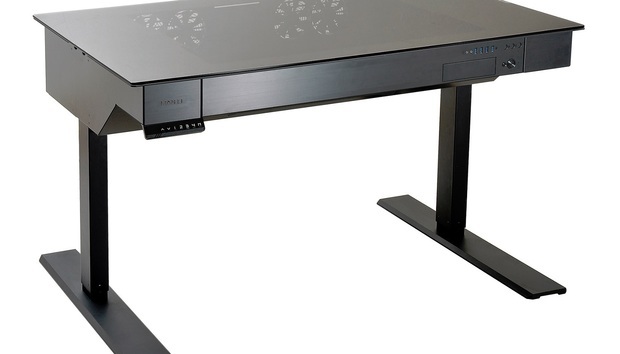 The motor can elevate the desk from a minimum 30.7 inches (for when you want to sit) to a maximum 46.1 inches (for when you want to stand), and it includes four buttons for height presets. Lian-Li says the desk alone will go on sale on May 10 for $1500, which doesn’t include any PC components or the operating system. It’s unclear exactly where the desk will be available, but Lian-Li’s U.S. retail distributors include Newegg Business, MicroCenter, and PhantomPCs. Why this matters: Research still conflicts on how helpful standing desks are for your health, but if you’re planning to sit down for a few hours of uninterrupted gaming, it might not hurt to spend some time on your feet first. While there’s no shortage of motorized standing desks on the market already, a desk with the gaming PC seems more conducive to keeping your monitors and speakers from tipping over.